Into the Wild, the 14th episode of Sleepy Hollow’s third season, abandons the goodness of having everyone work together to go back to the old formula of having everyone doing their own thing, and intercutting between the separate stories. Abbie needs to go off on a FBI survival training exercise. 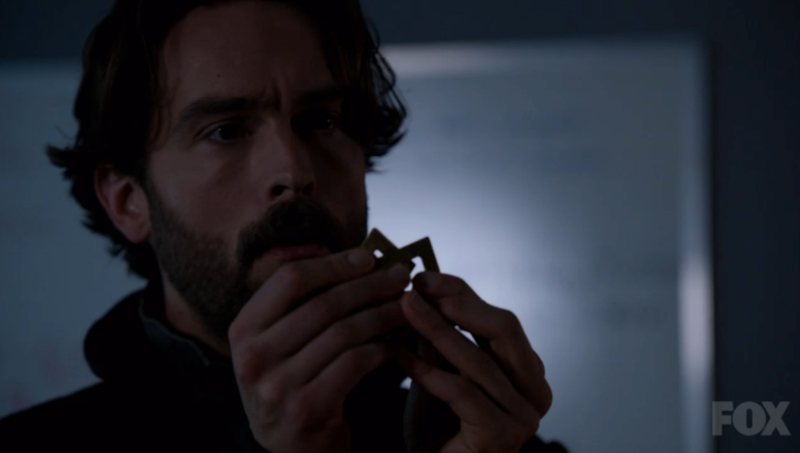 This leaves Crane to continue his investigation into Abbie’s mysterious symbol alone. Crane seems like a sad puppy dog when he realizes Abbie won’t be joining him but he reluctantly agrees to go alone to meet with a professor that might shed some light on the subject. Abbie’s FBI training starts off as we would expect. She is teamed up with none other then Agents Foster and Reynolds… and a guide. They have 2 days with no cell phone, and no provisions to make it to a waypoint on the map. Along the way, they find an old Dutch well that it seems something has recently broken out of. 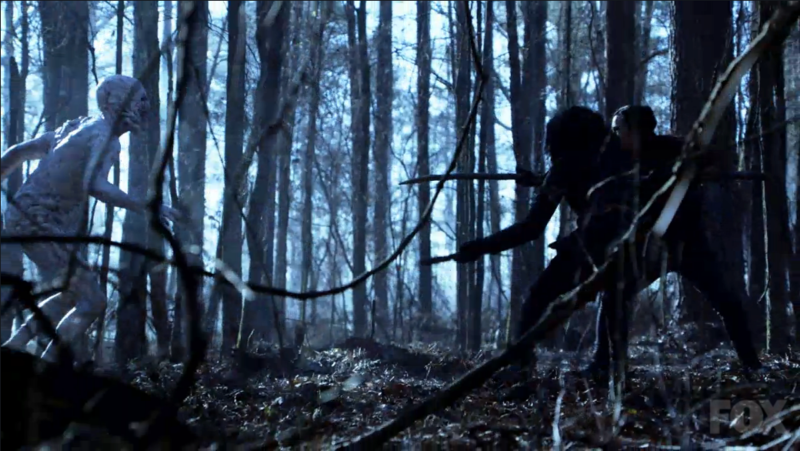 It doesn’t take long before that thing attacks their guide, and Abbie fights it off. Abbie and Foster are forced to deal with the creature alone since Abbie doesn’t want to involve Reynolds in what is going on. They eventually find an abandon cabin, and convince Reynolds to go for help while they take care of the injured guide. 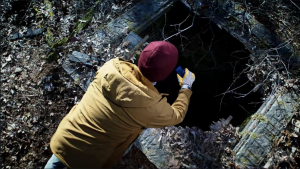 In the cabin, Foster finds an old journal that explains that the beast killed dozens of Dutch settlers before being trapped in the well by a trapper. It goes to explain that the victims of the creature turn evil themselves (much like a vampire, or zombie). Abbie decides that the creature is like an infection, so they should be able to destroy it with antibiotics. After mixing up some shaman style antibiotics, Abbie and Foster go hunt for the monster. Meanwhile, Crane and his new professor friend have discovered that the symbol is actually 2 piece held together magnetically. They can be slid apart in much the same way as Crane’s tablet from the beginning of the season. When the professor leaves the room for a moment, crane takes the tablet from his satchel (because I guess he just carries that around with him everywhere). After sliding it apart, he notices an imprint of Abbie’s symbol on the back of each half of the tablet. (why did he never notice that before?). When Crane puts the two halves of the symbol onto the two indents in the tablet, he has a vision of Abbie fighting the beast, and must rush off to help her. Abbie and Foster’s antibiotic tipped spears seem to be working. 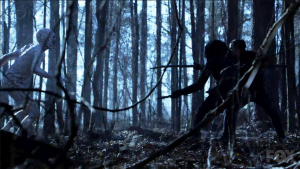 As Abbie fights the beast, she gets a stab into it’s belly and the wound blackens and reacts. The beast howls in agony and runs away toward Foster. 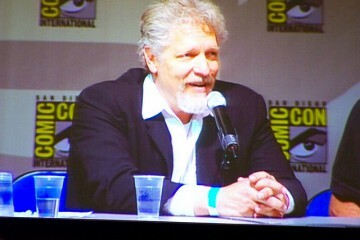 Foster fights with the beast, and Abbie joins in. The Crane shows up and shoots it with his flintlock pistol. We will guess that Abbie and Foster did enough damage to it with their antibiotic laced spears before then, because Cranes gun shouldn’t have done anything to this creature, but it does. The creature disappears into the ground, and the guide is cured of his affliction. Also in this episode, the Jenny and Joe sitcom moves on. Jenny hears rumors of a secret black market auction of a mysterious Sumerian artifact, and her and Joe head off to check it out. The object turns out to be a rather large piece of Pandora’s box. Joes uses his new money to win the bid, but on their way home, Pandora confronts the pair demanding her artifact back. Pandora puts Jenny in a force choke, and Joe freaks out. He grabs the artifact, and when he does, he begins to turn back into the Wendigo he became in season 2. 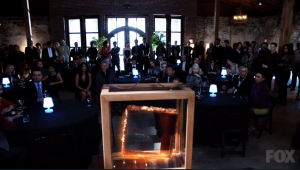 He attacks Pandora, and she flees leaving Joe and Jenny with the box remnant. This episode didn’t work to well for me. In my opinion, this Sleepy Hollow is about Abbie, and Crane. It isn’t about Abbie and Reynolds, or Jenny and Joe. If you separate Abbie from Crane, the show doesn’t work. That being said, the monster this week wasn’t that good either. It really did look like a guy in a latex suit. It had no personality, and without Crane there to give first hand knowledge of the colonial occurrence of the creature, that part just seemed forced. This show seems to have found a formula that works, and Into the Wild, like many other episodes, does everything it can to not stick to that formula.